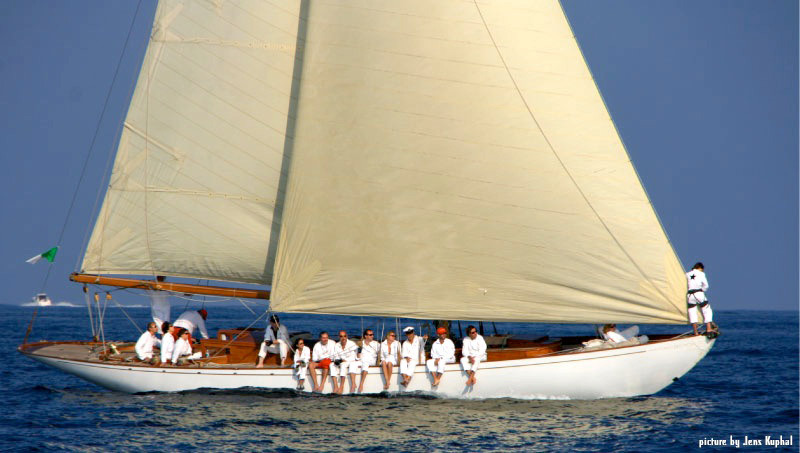 Sail on this classic yacht and share the dream! 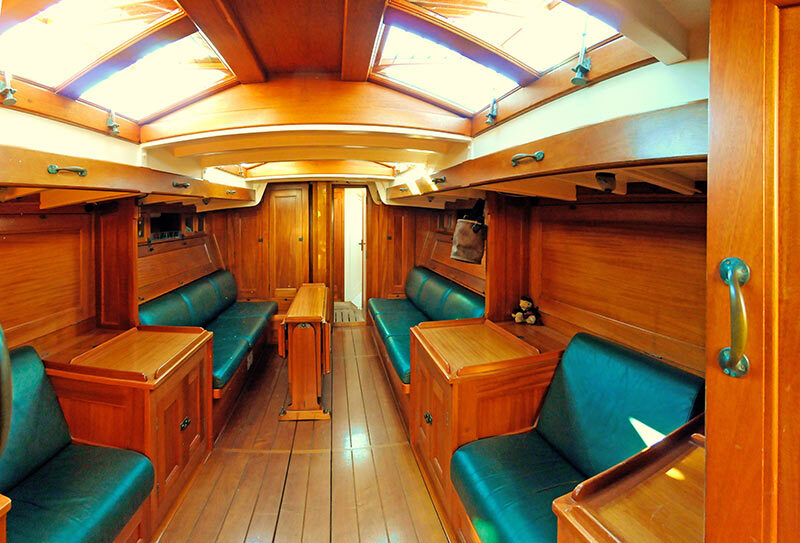 Her snow-white teak strakes and her interior decoration crafted of Honduras Mahogany rank Eilidh as one of the most stunning and impressive classic yachts in the Mediterranean. While you sit in the grand, open parlor, taking a sip of an old Whiskey, listening to the waves, you will be taken back in time to the golden sailing days of the 1930s. Eilidh will let you experience truely special moments for a day, a weekend, or even longer. A service staff member will pick you up at the airport and take you to the yacht. On site, Eilidh's skipper Jean-François Behar will welcome you. He will familiarize you with the secrets of this yacht. His twenty years of sailing experience in the Mediterranean and Eilidh's unique qualities are your guarantee for an unforgettible trip! You will start your adventure at the harbour Marseille Vieux and from there take off to truely fantastic, historical places in the Mediterranean. 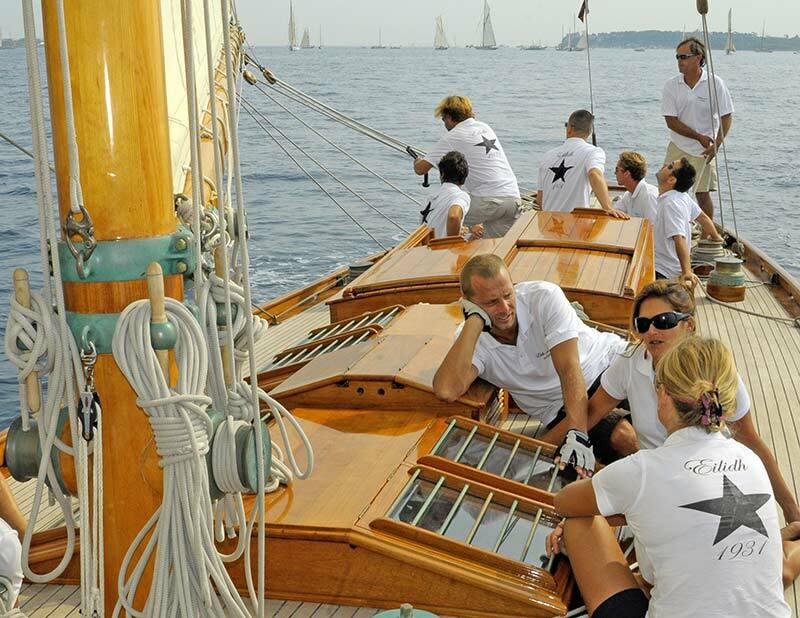 If you seek more adrenelin rush, you can participate on SY Eilidh in most famous classic regatta in the Mediterranean, such as the Royal Regatta Cannes and Les Voiles de St. Tropez. The story of Bermuda cutter Eilidh begins on May 22nd, 1931, the day of her launching. 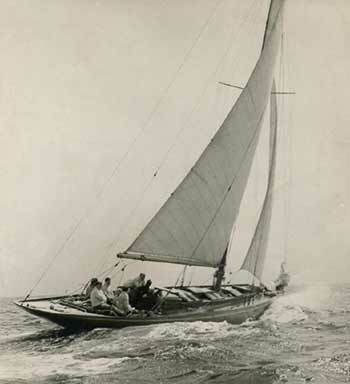 She was built a year earlier, designed after a draft by the designer Alfred Mylne of the Dickie's Brothers who had just relocated from Tarbert to North Wales. The client who ordered the yacht was T.E. Russell. 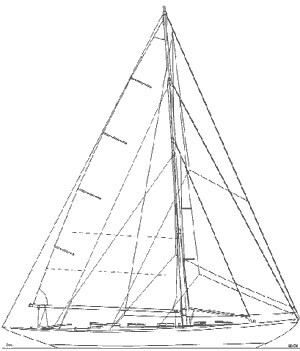 He wanted a fast and convenient regatta racer for himself and his growing family. Eilidh was named in memory of the owner's niece, Helen Russell (Eilidh is the Gaelic name for Helen). Helen had died under mysterious circumstances at the young age of 17 in March 1925 in Paris. During the following years Eilidh won many races and was traveling extensively with her owners on the west coast of Scotland. After four summers in Scotland, the Russell family decided to explore the waters of Scandinavia and the Baltic Sea. They sailed Norway, Sweden, Denmark, Finland, Estonia and Lapland. In July 1938, the author K. Adlard Coles (writer of the sailing classic “Heavy Weather Sailing”) saw Eilidh anchored at Stora Sottunga (Finland). He mentioned this memorable moment in his book "Mary Ann among 10 000 Islands". After sailing around Finland, Eilidh did not make it back to Scottland but had to be left at a shipyard in Hanko (Finland) in the summer of 1939 as there was no way to transfer her back home. During the war she remained in Norway, was sailed and well taken care of by officers of the German Air Force. It was not until the summer of 1948 that Eilidh finally left Hanko and was sailed back to her British home port Colintraive. In 1972, after 42 years in the Russell family, Eilidh started a new life with John Miller and his family who also sailed her intensely. Twice they won the Scottish Blue Water Regatta and achieved high performance by sailing the route from Clyde to Brest in a day and an hour at a sailing event in 1994. 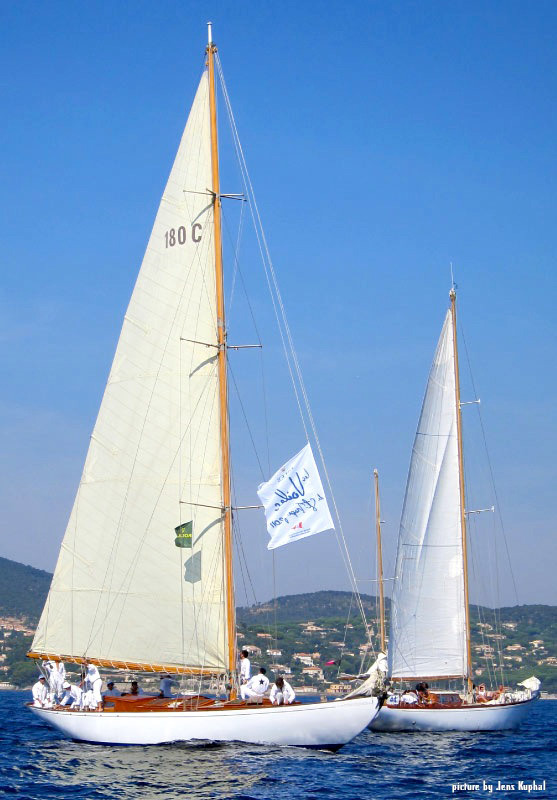 In 2001, Eilidh's present owner brought her from Dumberton to Gilbert Pasqui's shipyard in La Darse, Villefranche. There the aged lady underwent her biggest refit and in an extensive process her original splendor was was restored. The effort took almost three years but already during that time Eilidh graced the old dock in La Darse and received many awards for her participation in various Mediterranean regatta. 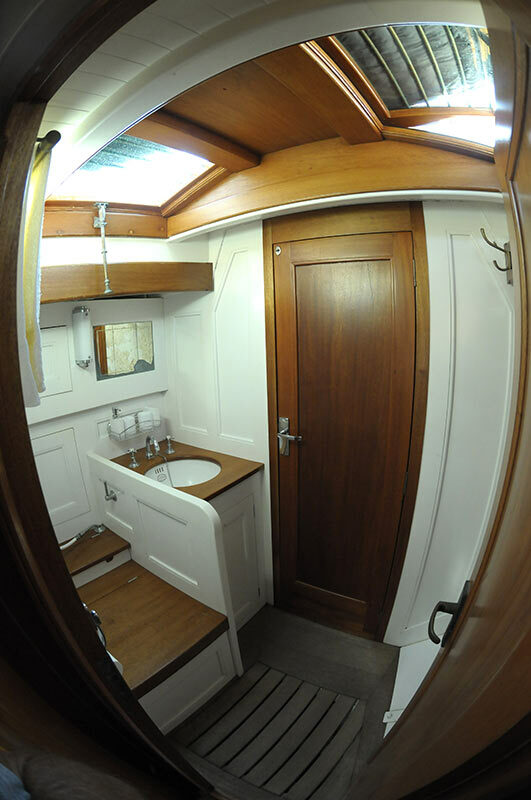 In summary, Eilidh is a beautifully restored historic yacht whose present owners still maintain her with care and affection. Sailing back in Time - Eilidh Experience this beautiful classic and let Eilidh's charme take you on a journey back in time! Eilidh is available for short cruises as well as day and week trips. If you are looking for a more adventurous time on this historical yacht, you can partcipate in various regatta and events in the western Mediterranean. If you have any questions regarding planing and availability, please contact us! 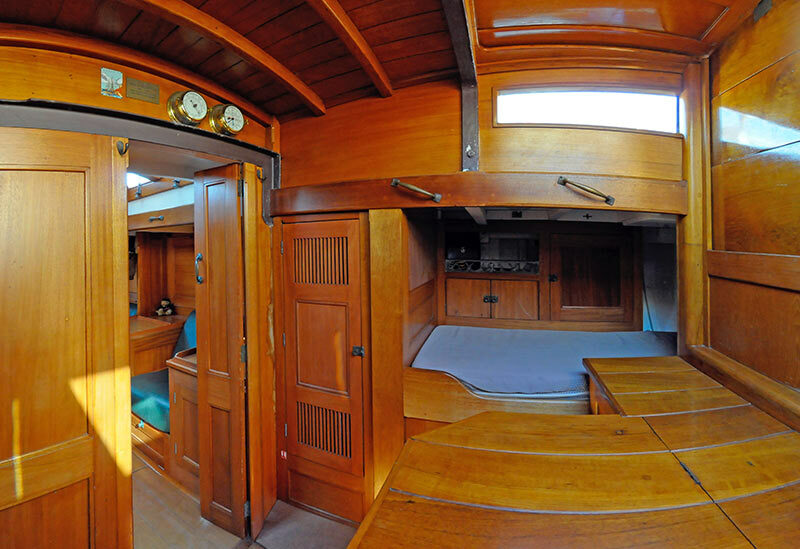 Interested in Classic Yacht Eilidh?